And they say flashy kicks don’t work in the Octagon? Anthony Pettis provided us with a more than stellar performance after that unforgettable flying kick off the cage straight into Ben Henderson’s face and attaining the WEC Lightweight Championship belt. He did it all in spectacular fashion and in the FORM Athletics Anthony Pettis WEC 53 Walkout T-Shirt. 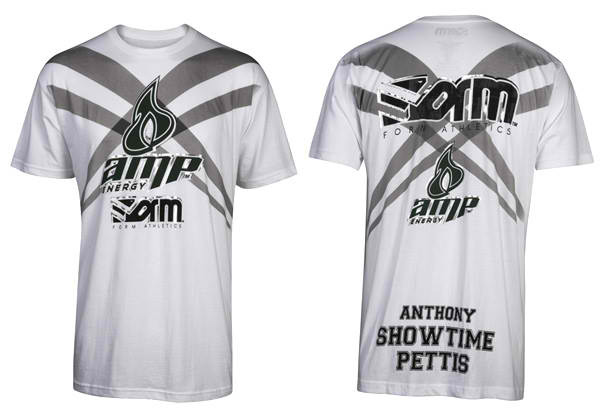 The FORM Athletics Anthony Pettis WEC 53 walkout t-shirt features a 100% cotton, 3-color screenprinted and softhand inked graphics with metallic foil, along with sponsors such as FORM Athletics and AMP Energy. Also includes a SHOWTIME graphic in the back. FORM Athletics Anthony Pettis WEC 53 Walkout T-Shirt available at MMAOverload for $29.99.